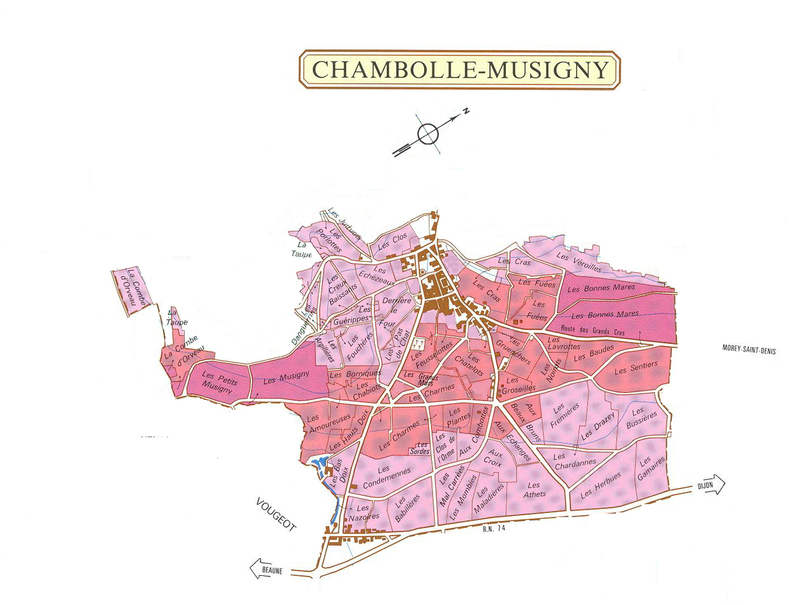 Chambolle-Musigny is a wine appellation that includes some of the finest French Burgundy wine. 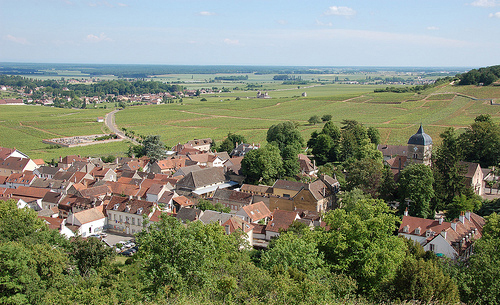 Wine so labeled must come from vines planted in the commune of Chambolle-Musigny, which is situated in the Côte de Nuits region of the Côte-d’Or department in Burgundy in eastern France. Chambolle-Musigny is a generally square-shaped commune lying between Vougeot to the north and Morey-Saint-Denis to the south. The Grône River, flowing southeasterly, bisects the commune as it runs from the heights above the village through a natural valley (“combe”) toward the Route National 74. Two slopes rise from the river valley at either end of the commune. The name “Chambolle” derives from the Latin campus ebulliens, or boiling field (champ bouillant), which was apparently descriptive of the Grône when swollen and overflowing its banks into the adjoining fields after a rainstorm. The commune does nor appear to have been settled in antiquity and first emerges in the historical records around 1110 A.D. as “Cambolla,” a vineyard area run by the ubiquitous monks of Cîteaux. From the early 14th century until the early 16th century, Chambolle was a vicarage of Gilly-les-Cîteaux. The vineyards of Chambolle-Musigny occupy 180.31 hectares, of which 94.69 produce village-level Chambolle. There are 61.36 hectares of premier cru Chambolle divided among 24 different climats, although only a few of these are well known. The best known is Les Amoureuses, which is essentially a Grand Cru in all but name. The best of the rest include Les Charmes, Les Fuées and Les Cras. There are 24.24 hectares in Chambolle that contribute to the commune’s two grands crus, Le Musigny and Bonnes Mares. Virtually the entire production of the commune is red. Only one tiny and rare cuvée of white, Le Musigny blanc from de Vogüé. Chambolle-Musigny is unique in the Côte de Nuits for the chalky composition of its soils (unlike the clay soils relevant elsewhere). The thin, calcareous layer clings to a hard rocky soil beneath, which stresses the vines and sharply restricts their yield. These soils are largely responsible for the singular qualities of Chambolle-Musigny: in the words of the Burgundian poet Gaston Roupnel, wines of supreme delicacy, special wines of silk and lace. The leading producers of Chambolle-Musigny include Domaine Comte Georges de Vogüé, Domaine Georges Roumier, and Domaine J-F. Mugnier.